FWIW, your Baseband version is Unknown... mine is -8953_GEN_PACK-1.82698.1.83731.2 after this update. Anyone else having issues--is your Baseband version also Unknown? After reading your guy's issues after the update, I should consider myself lucky I didn't have any notable problems so far. I too use TMobile but one thing that might be different is I bought my phone only 2 months ago so it's possible that the newer models might be less problematic? I bought mine over a year ago but when I updated, my SIM was in another phone. Not sure if that made the difference or not (and I'm not sure how it could make a difference), but I haven't had any problems after updating. Still having the "No SIM" issue. This morning I noticed that the battery level is much lower than usual, obviously the phone is busy doing something. More details of the phone, can I provide any other diagnostics? I have tried toggling the airplane mode, it had no effect. I've also noticed that in addition to the SIM error issue, the GPS is no longer working on Google Maps and a driving app that I use every day. GPS works for me. That seems to be a separate issue. To clarify the GPS issue, it is the device only GPS that is not working for me. Google location services using Wifi does work. It seems relevant since it was working before the update. Good point. I'm not certain how my phone determines my current location. I guess I'll have to go for a drive to make sure the location is continuously updated. Or is there a simpler way? I bought mine at pre-release sale. Definitely one of the early versions. Note that if you launched Google Maps while on wifi it has probably cached your location, so clear the cache or reboot before checking again. The driving app that I use is called Road Mate, it only uses the device GPS because I wrote it that way. It would be good if someone else could confirm the GPS issue. 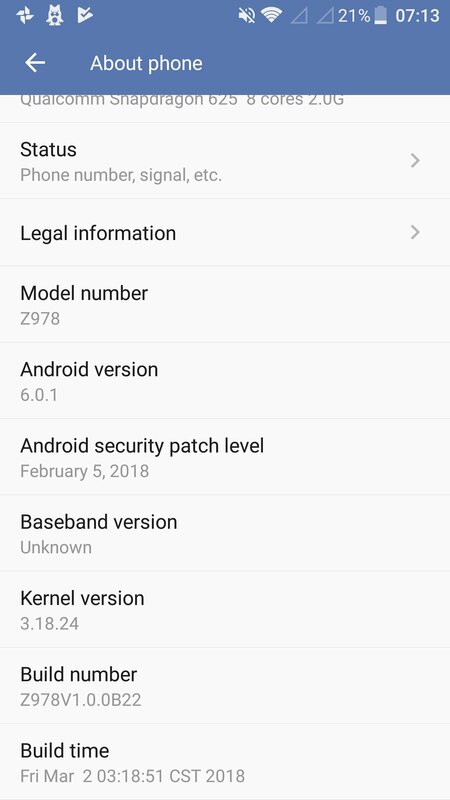 I am having issues and my baseband version is unknown. I bought mine about 1 month ago. I updated yesterday without the sim card in the phone. I am using Mint which is an MVNO of T-Mobile. I just put my sim in the Blade and everything came up fine and all is working great. Like I said I bought the phone from Newegg about 1 month ago. I hope this might help some. If ZTE would post the link to the previous software version for download, wouldn't that possibly fix the issue? I want to throw an idea out there. Please do not get offended by this. I am just trying to help. But is there any possible way that those of you having issues might have placed the sim tray into the phone upside down? The sim tray will still go into the phone upside down but it might take just a little bit more force to install. I just put mine in upside down to check and I get the no sim card error also. It's a simple thing to check. For me at least, the phone was fine while SIM was in. It then updated and I got the SIM card issues without touching it. Even if ZTE did post a link to the previous firmware, as far as I know we have no way to flash it yet. Same here. The update was pushed onto the phone and after the update the issue showed up. I did not touch the SIM. R&D is looking into to issue now to come up with a resolution as soon as possible. My ZTE 978 (V8 Blade Pro) is also showing No Sim Card for both sim-cards on it. I have had this phone since Dec 2017, and this problem just started yesterday. Tried removing and replacing sims multiple times. I called ZTE Support and was walked through the steps of deleting cache partition. No luck. They are asking to do a factory reset and if that does not work, send the phone for warranty repair, but I cannot stay without this phone for 10+ days of repair time, not to mention shipping costs and factory-reset etc. Looking at this forum, many users appear to be receiving similar error. Please comment if anyone has a found a resolution. Thanks. Looks like you are correct, GPS is impacted as well. Just downloaded GPS Test app, and it shows 0 satellites. Compass does work though. Is the problem understood by R&D? Any point for us to do any additional experiments? Not a developer, but wouldn't all you had to do was download the older version to the root folder of the SD card, and either flash it from the recovery or software update menu? I know HTC had it that way when I had my one m8 a couple of years ago. They also have/had a developer page that had every model and the various associated firmware versions from oldest to newest, which at the time was ice cream sandwich for the HTC one m8. We’ll reach out if they request any additional testing. Good point. Is there a way to revert back to previous release to get the phone working until this issue is fixed? On phone with ZTE Support - they say there is no way to reverse the Patch. Will this get resolved ? @sam25 Absolutely, it will get resolved. As I have stated earlier, R&D is aware of the issue and they are working on a fix. Is there a time frame on when the patch will be available? @digiduck_2582 We cannot promise a timeframe but they are working to get it resolved as soon as possible.